die plakate sind 1500 mal über das zentrum von wien angeschlagen. 500 mails wurden verschickt. alle zeigen auf den 04/04/08. die spuren davon werden im öffentlichen raum von wien noch lange lesbar sein. 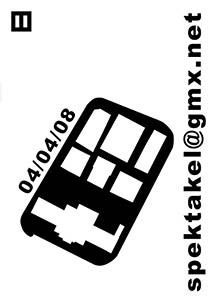 das projekt spektakel 04/04/08 ist ein beitrag zur ausstellungsreihe unORTnung III. my project is the announcement of a happening. the goal of this happening is to increase the visibility and acknowledgement of 'genochmarkt' (a location on the periphery of vienna) in the central area of vienna proper. this will be accomplished by leaving 'traces' of genochmarkt. the announcement of the happening will take place through posters placed in the public spaces of vienna, along with an email campagin. the happening will take place at the 'genochmarkt,' and the exact coordinates will be delivered via the internet. interested visitors will write to spektakel@gmx.net. the announced happening is, however, a fictional spectacle. unkowningly, visitors to this 'fictional' spectacle will turn themselves into actors and creators of the happening. there will be 1500 posters distributed across the center of vienna, and 500 mails have been sent. all advertisements of the spectacle refer to the date of 04/04/08. the remnants of these advertisements will be readable for a long time in the public spaces of vienna.